* For equivalency calculation refer to footnotes of Tables 1 and 2. Figure 2. 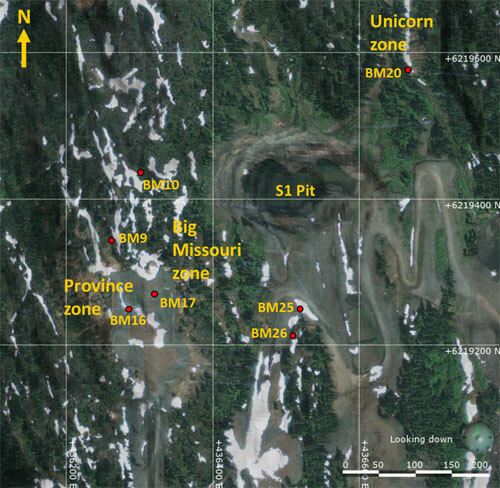 Plan view of the Big Missouri ridge showing the location of the drill pads discussed in this release. The drill holes for each pad are listed in table 4 below. The Company is concurrently undertaking exploration activities to expand high-grade resources whilst working on engineering studies toward recommencing underground production near the Premier mill site. The Premier site has established facilities and infrastructure (mill building, tailings facility, power line and over 40 miles of underground development with ventilation and second egress). The current drill program is an integral part in this process which is to expand the existing resource base to support engineering studies that commenced in the second quarter of 2018.